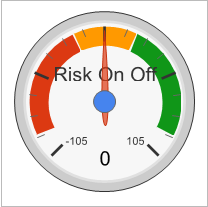 What Is the Risk On/Off Trading Signals Gadget? 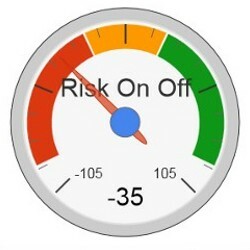 The Risk On/Off Trading Signals Gadget is designed to publish on a minute-by-minute basis a score based on how the major global financial markets are moving. It looks at recent live completed financial transactions on a minute by minute basis and computes a score based on that progression of transactions. It is designed to offer a window into the movements of the largest markets and traders in the world and attempt to quantify the direction of those movements into a simple to understand trading signals gauge. It should be used as intended - an educational and / or amusement tool designed to shed light on a particular area of interest to me: Global Financial Markets. It should NOT be considered or used to make trading decisions or investment decisions. Financial advisors are available at your broker for that purpose. Using the Risk On/Off Trading Signals Gadget is relatively simple. The gadget is designed to operate during US trading hours, updating each minute. Scores computed outside normal market hours should be ignored entirely. It computes a score and outputs it on a simple gauge with a range of +/- 150 points - with range indicators of Red, Orange, Green, and White. 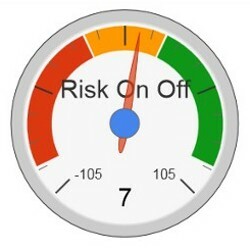 A high score (up to a certain level) in the green zone typically is meant to indicate that market participants at the global level have been demonstrating (through completed transactions) an increased appetite for risk. This generally would be considered a positive trading signal for US Equities markets. However, there are times when the market gets "too hot" - indicated by the White area on the right side of the gauge. When the score is in the white area it indicates that strong "Risk On" buying has been taking place over several minutes - which could be an indication of a short squeeze somewhere in the market with a high risk of pullback imminent... or so the theory goes. A low score on the gauge (in the Red area) would indicate a sustained level of selling off of major global markets. It is meant to demarcate levels of selling consistent with withdrawing from Risky assets into safer-haven securities. An extremely low score (in the White area below the Red) would tend to indicate extreme periods of risk-averse, possibly in reaction to a global disaster event, terrorist strike, or institutional failure (think Lehman collapse). What Does a Zero Score Mean? A Zero score - or scores in the Orange (Google calls it Yellow but it don't look yellow to me...) range indicate no clear direction of major market participants based on their completed transactions. The Gauge Isn't Working! Why Isn't It Showing?? ?